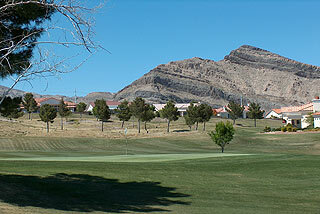 Highland Falls Golf Club in Summerlin (North Las Vegas) is one of three 18-hole courses that from the Sun City golf complex, with the others being Palm Valley and the Eagle Crest executive course. 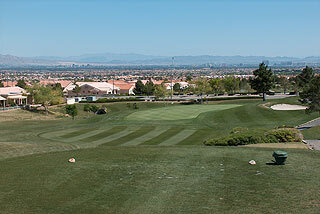 Highland Falls is a par 72 Casper/Nash design with 4 sets of tees measuring between 5502 and 6512 yards, set as high as 3035 above the Vegas Valley . 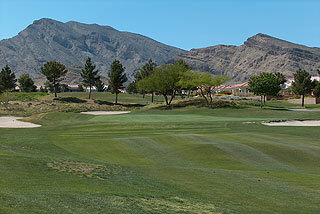 spectacular mountain views form the background of many holes, as the layout plays to a challenging 130 slope rating. 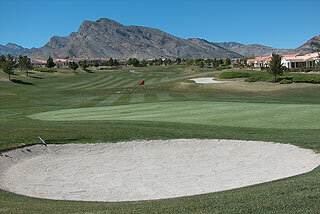 Similar in conditioning to the Palm Valley and Eagle Crest layouts, Highland Falls features manicured fairways and greens that are medium in size and only mildly undulating, making this course a putter's delight. Strategically placed bunkers guard the greens, and water hazards - though infrequent, add aesthetic beauty and also create obstacles to scoring. As with all three Sun City courses, Highland Falls features its own driving range and putting green, along with a beautiful clubhouse with great views of the course available from the pro shop and from the Highlander Restaurant. 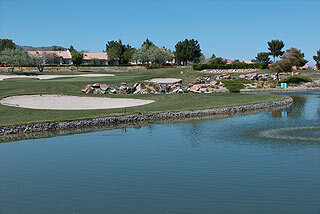 Banquet and outing facilities are also on property. 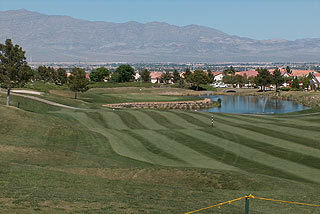 Looking to play a quality round of golf in the Vegas area for under $100? We recommend Highland Falls. The layout may surprise. you, and the conditioning and service are great values for the area. The course winds its way through a residential community, though at no time do the homes feel as though they are on top of you. It is perhaps the most unique of the three Sun City courses - and as our photos indicate - the views are as pretty as you will find in the area. For more info, visit our informational page, with link to their web site, by clicking here.